YouTube’s comment section isn’t exactly known for being a hotbed of in-depth intellectual conversations. One of the reasons for this, some would argue, is the fact that YouTube still lets people post comments using handles like ‘cutepuppies99’ without having to reveal your real identity. Starting today, however, you will have the option to use your Google-wide Google+ -based identity that will show your real name (or at least the name you are using on Google+) to all YouTube users. Google actually has been giving new YouTube users the option to use their Google-wide identity on YouTube since March. What’s new today is that even existing users can switch their old YouTube handles to their Google+ profiles. 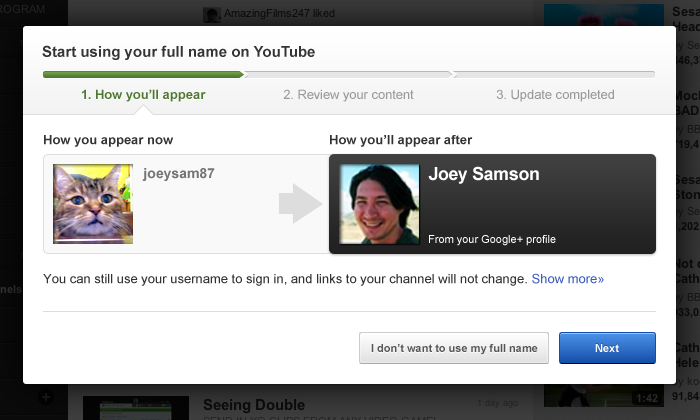 This means you can now use both your real name on YouTube and display your Google+ profile picture. Given that you may have posted some videos or comments under the guise of anonymity that you would rather not be associated with under your real name, Don’t worry. Google also lets you see your comment and video history, as well as your public playlists, and lets you decide whether you want it to be associated with your full name.